After a successful Kickstarter campaign funds for the amount needed to mount the exhibition and self-publish the accompanying book was raised in July 2012. The photo exhibition features the work of up-and-coming photographer Jay Franco; who made a name for himself last summer with the popular photo exhibit “New York City: Over and Under.” The book will be written and edited by Paola “Pie” Soto and Ankita T. Pandya and will feature background and stories from all of the subjects whose portraits are part of photo exhibit. Faces of Hope is a one of a kind photo exhibit and self-published book about the 10 individuals and their stories of survival and triumphs. 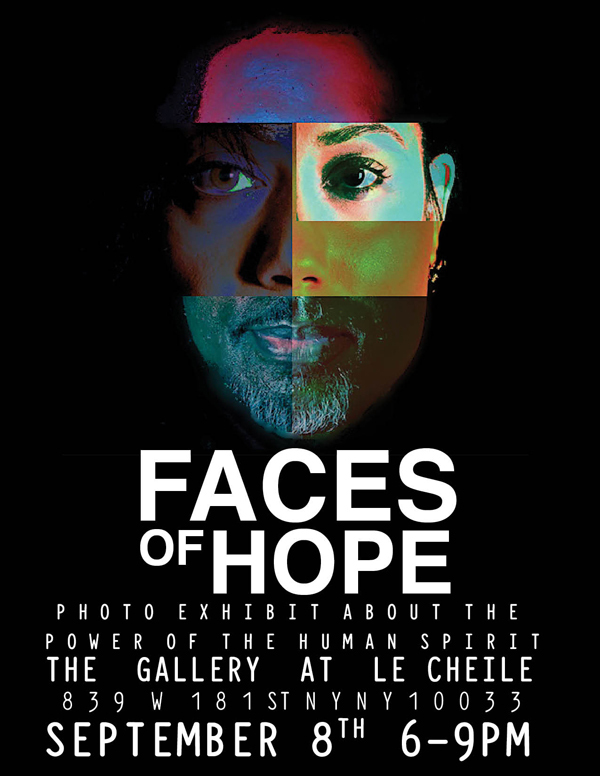 It features individuals living with illnesses from HIV, to Lupus, to a survivor of triple negative breast cancer, drug abuse, to victims of human trafficking, and sexual abuse, among others the exhibition aims to showcase the power of hope. Photographer Jay Franco will unveil a new photo exhibit curated by Roger Reeves. The exhibition focuses on the stories of men and women living in New York who have experienced and overcome great adversity in their lives.